Utah's lone Democrat in Congress could find himself in the fight of his political life. 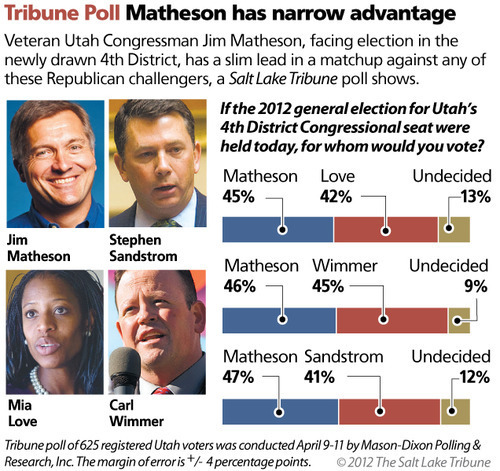 Rep. Jim Matheson will face a dogfight in his bid to return to Congress no matter whom his opponent is, with all three leading Republican candidates nipping at his heels, according to a new Salt Lake Tribune poll. Former state Rep. Carl Wimmer trails the Democratic congressman by a single percentage point  46 percent to 45 percent. Matheson barely leads Saratoga Springs Mayor Mia Love, 45 percent to 42 percent. Both candidates are within the 4 percentage point margin of error, making the race essentially a dead heat. Former Rep. Stephen Sandstrom is not far behind, trailing 47 percent to 41 percent in a head-to-head matchup against the incumbent congressman. Matheson is again one of the national Republican Party's top targets. "It ought to be cause for concern for the Matheson people, but no reason to hit the panic button," said Quin Monson, associate director of the Center for the Study of Elections and Democracy at Brigham Young University. "He's got the same record he's always had. He's got as much money to communicate as he's always had. He's going to swim upstream against the tide with [Mitt] Romney at the top of the ticket, but I think he's used to swimming upstream." Matheson said he isn't alarmed by the numbers. "My job approval number is very solid, and I always run on my record. I haven't even ramped up the campaign to do that, but when I do, I think we'll be successful," Matheson said. Matheson also said he is not at all concerned about which of the Republican candidates he goes up against. "Seriously, no," he said. "I think they have all taken very extreme positions on issues, so I feel well positioned" to make a case to voters. Ten percent of those surveyed said Matheson had done an excellent job in Congress, while 45 percent said he had done a good job. Seventeen percent rated his performance as fair and 17 percent judged it to be poor. The Republican candidates vying for the party's nomination heading into the GOP State Convention on April 21 each sought to portray the poll as proof that they are best positioned to beat Matheson in November. "Holy crud! That's outstanding news," Wimmer said when told the poll results. "The biggest question the [Republican] delegates have had is which one of the candidates can beat Jim Matheson, and this poll shows I'm in the best position to do so," Wimmer said. "It clearly shows that Jim Matheson is beatable … and I believe I'm going to be the candidate who will defeat him." Love said she sees the poll as an indicator that voters are getting to know who she is  she trailed Matheson badly in earlier polls by other organizations  giving her a better chance of winning than her better-known opponents. "If that's the trajectory, I'm the only one who can beat Jim Matheson," she said. "Carl Wimmer and Stephen Sandstrom, those guys have been in the Legislature and Carl has been running for Congress for two years. … Eighty percent of the people Jim Matheson has been up against have been state legislators, and he's beaten 100 percent of them. Why would now be any different?" Sandstrom said the poll shows any of the three has a shot at knocking off Matheson, but he will be a formidable opponent. "I think ultimately voters will realize I'm the only one who can beat Matheson, because I'm a businessman who has a successful business career. I've created jobs. I have a military career that nobody else does," said Sandstrom, a former Marine. He also served on the city council and in state government. Sandstrom said he believes he will close the gap easily when voters get to know him better. Brad Coker, managing director at Mason-Dixon Polling & Research, which conducted the poll for The Salt Lake Tribune, said Matheson should probably be concerned by his own showing in the poll, more so than that of his opponents. "The fact that he's under 50 [percent] is probably more disconcerting than if he's up one point or five points. Whoever wins the Republican nomination is going to get a bump, anyway," he said. "If you're under 50, you're in trouble. [The Legislature] obviously crafted this district in a way to make him sweat." The survey of 625 likely voters in the new 4th Congressional District was conducted April 9-11 by Mason-Dixon. Lesser-known contenders for the Republican nomination were not tested in a head-to-head matchup with Matheson. Voters were also asked whom they would choose if they were selecting the Republican nominee in the 4th District. Wimmer received 35 percent, Love 23 percent and Sandstrom 14 percent. But the question was not limited to Republican delegates  who will take the first crack at narrowing the field. If none of the contenders gets 60 percent support from delegates at the convention next week, the top two vote-getters will be on a primary ballot in June.